No, a much more realistic and fulfilling resolution is this: to finally invest in all those wardrobe staples that you neglected in 2016. Here are 19 items to get serious about in the New Year. 1. Though we rarely suggest wearing your work suit after hours, investing in a sharp all-rounder that doesn’t look out of place wherever it is worn can pay dividends if pressed for time or luggage space. Choose wisely and take care of your investment and you’ll have a loyal servant for many years. 2. Chinos. Get one pair in navy and one pair in stone and watch as they take on everything from the boardroom to the beach hut. Uniqlo and Massimo Dutti rarely fail to deliver in this department. Once you learn your go-to brand and size, store the details in your phone so you can restock with ease. 3. So fundamental that it’s often overlooked, a succession of good quality white shirts serves as your blank canvas for the year. Sport them at everything from work to weddings, christenings to Christmas drinks (yes, they’ll be back around again soon). 4. An understated watch. Yes, you’ve got a clock on your phone screen but nothing sets off a cuff like the slightest hint of leather and precious metal below it. 5. A quality dinner jacket. Because hiring one is far too high school prom. Plump for something classic and in natural fibres – you don’t want to receive a static shock every time you reach for a drink. A slightly more decadent, ‘special occasion’ feel can be achieved with a velvet blazer. Shawl lapels will also make anyone look like Jay Gatsby, which is no bad thing, eventual (*spoiler alert*) murder aside. 6. The perfect foil to the flip-flopping British microclimate, a solid trench coat should be waterproof and wind-cheating, yet lightweight and smartly tailored. 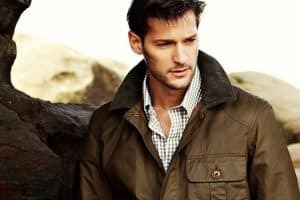 Burberry is the gold standard here, but there are some very good value offerings from high street favourites like Zara and Charles Tyrwhitt. 7. Provided it’s not night time (it’s very unlikely that you’re T-Pain), there is no outfit a pair of well-fitting sunglasses can’t improve. Funeral? Check. Summer suit? Of course. Pair of budgie smugglers and a moustache? It can’t hurt. We suggest a pair from Ray-Ban, Oliver Peoples or Persol. 8. A bomber jacket. The military-streetwear hybrid was copied verbatim from the jackets worn by American fighter pilots in the Second World War. The features that defined it in the air – a low cut collar to avoid tangling with parachute cords; a bright lining to improve visibility if bailing out into the ocean – are what make this now ubiquitous piece so versatile on the ground. 9. Grandad, band, stub – whatever you call it, the long-forgotten collarless shirt has made a stellar comeback in the last few years and now sits alongside the Oxford button-down as a versatile smart-casual stalwart. Place it below a crew neck knit for a more striking collar line, or wear with an unstructured blazer for a rakish take on tailoring. 10. Sturdy lace-up boots. Durable, reliable, all-weather, and with a rugged, timeless charm: pulling on a pair of well-made lace-up boots is like sliding your feet inside two Land Rover Defenders. 11. White sneakers. Low-cut, understated tennis shoes have been rendered indispensable once again thanks to the combined efforts of the Adidas Stan Smith and new kids on the court, Common Projects and Axel Arigato. Now acceptable to wear even with a suit, providing you keep them clean. 12. A pair of indigo selvedge jeans. Often spoken about in the same breathy tones as Patrick Bateman, selvedge denim’s popularity has boomed in the last few years – and for good reason. Crafted on traditional looms and cutting machines (ideally in Japan) and built from thicker, hand-picked cotton that wears uniquely, selvedge jeans are a serious investment that sit happily above almost any footwear. 13. Shearling jackets may have only recently made a mighty comeback but there has never been a time when the seventies staple hasn’t been cool. Of course, shearling doesn’t come cheap and for that reason quality borg (faux shearling), which offers the same effect without sacrificing too much warmth, is a worthy substitute. 14. A preppy twist on the classic leather garter, a woven belt is equally at home holding up chinos as it is threaded through summer shorts. 15. Sharper than a sweater, snugger than a shirt, a roll neck is the ultimate wingman when it comes to dressing smart without suiting up. Steve Jobs may have sadly passed, but this staple is alive and kicking. 16. A slim cardholder. Because, why ruin the lines of your expertly tailored trousers with a chunky wallet filled to the gills with old receipts and Nando’s loyalty cards? 17. There are two truths universally acknowledged: one, your phone will break irreparably within minutes of you not protecting it; and two, most smartphone cases look like they were bought three for a pound off a late night shopping channel and made from recycled Tupperware. Solve the great conundrum with a sleek yet robust option from a brand like Aspinal of London or Native Union. 18. Some classic swimming trunks. Go for something with a button fastening for a sleeker, altogether more Daniel Craig-y look. Orlebar Brown has shaken things up in this department, flanked by Brazilian brand Frescobol Carioca and, more surprisingly, Ralph Lauren. 19. Buttery soft leather loafers remain a footwear icon that re-invents itself every decade. You might think Gucci’s horsebit model is more of a luxury than a solid investment, but there’s a reason it’s been the calling card of the foot loose and fancy free for more than half a century. If the budget won’t stretch, look to the original: Bass Weejuns.